Assignment Why, after over thirty years of hostilities, did Israel and Egypt finally begin to reach a peace agreement in 1978? Background On 17 September 1978, Israel and Egypt signed two agreements, the first between Israel and any of its Arab neighbours. The Camp David Accords were negotiated by the Israeli prime minister Menachem Begin and the Egyptian president Anwar Sadat under the mediation of U.S. President Jimmy Carter at the government retreat at Camp David, Maryland. Egypt and Israel had technically been at war since Israel's founding in 1948, and the latter had occupied the Sinai Peninsula (Egyptian territory) during the Six-Day War of 1967. War had again broken out in 1973. The Accords had their origin in Sadat's unprecedented visit to Jerusalem--the first visit ever by the chief of state of an Arab nation to Israel--on 19-21 November 1977 to address the Israeli government and Knesset (parliament) on the subject of peace. Sadat's visit initiated peace negotiations between Israel and Egypt later that year. The discussion continued sporadically into the following year, but when a deadlock ensued, Sadat and Begin accepted President Carter's invitation to a meeting at Camp David on 5 September 1978. Carter's had work tirelessly since his inauguration to find a way to bring about a permanent peace in the Middle East, and he now seized the initiative. 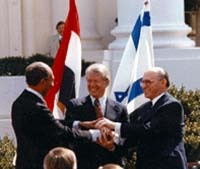 After twelve days of negotiations mediated by Carter, Sadat and Begin concluded two agreements: (1) a framework for the conclusion of a peace treaty between Egypt and Israel and (2) a broader framework for achieving peace in the Middle East. The first provided for a phased withdrawal of Israeli forces from the Sinai Peninsula and that region's full return to Egypt within three years of the signing of a formal peace treaty between the two countries. It also guaranteed the right of passage for Israeli ships through the Suez Canal. (2) The more general framework called in vague terms for Israel to gradually grant self-government and/or autonomy to the Palestinians in the Israeli-occupied West Bank and Gaza Strip and to partially withdraw its forces from those areas in preparation for negotiations on their final status of autonomy after a period of three years. Many experts regarded the "spirit" in which the two agreements had been negotiated as far more important than their substance. The peace treaty that Israel and Egypt eventually signed on 26 March 1979 closely reflected the Camp David Accords. Again, it was President Carter who had intervened to rescue the deteriorating peace talks with personal visits to both countries. The treaty formally ended the state of war that existed between the two countries, and Israel agreed to withdraw from the Sinai Peninsula in stages. The treaty also provided for the establishment of normal diplomatic relations between the two countries. These provisions were duly carried out, but Israel failed to implement the provisions calling for Palestinian self-rule in the West Bank and Gaza areas. The Camp David Accords and resulting peace treaty were a true foreign policy success for all involved. May 1948, Israel became independent. October 1956, Suez Canal Crisis. 5-10 June 1967, Six Day War. October 1973, Yom Kippur War. 14 March 1976, Egypt terminated its treaty of friendship with the Soviet Union. 2 November 1976, James Earl Carter elected U.S. President. 21 November 1977, Anwar Sadat addressed the Knesset (Israeli parliament) and declared that it was time to reach a peace agreement and to settle the Palestinian question. 17 September 1978, Sadat and Israeli Premier Menachem Begin signed the Camp David Accords. 5 November 1978, Arab League denounced Egypt. 1978, Menachem Begin and Anwar Sadat won the Nobel Peace Prize. 26 March 1979, Israeli-Egyptian treaty completed and signed. 25 May 1979, Israelis began to withdraw from the Sinai Peninsula. 25 April 1982, last Israeli forces left the Sinai Peninsula. WWW sites There is a substantial exhibit devoted to the Camp David negotiations online, including President Carter's invitation letter to Prime Minister Begin, the accords and a day-by-day calendar of events. You can listen to Anwar Sadat's Speech to the Israeli Parliament of 20 November 1977 that started the peace process. The full text of the Camp David Accords signed by Egyptian President Anwar Sadat and Israeli Prime Minister Menachem Begin in Washington, DC on 17 September 1978 are on line. There are alternative sites: gopher, mirror, Avalon Project and similar. Israel-Palestine Liberation Organization Agreement, 1993. The Middle East Peace Process, 1998 is a series of recent documents, briefing transcripts, press statements, etc., about the ongoing peace process (with some further links). 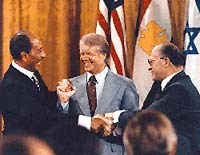 In 1978, Sadat and Begin were awarded the Nobel Peace Prize, and in 2002, Jimmy Carter received the Nobel Peace Prize in part for his role in the peace process. Jimmy Carter, Keeping Faith: Memoirs of a President (New York, 1982). Anwar Sadat, Those I have Known, Foreword by Jimmy Carter (New York, 1984). Anwar Sadat, In Search of Identity: An Autobiography (New York, 1978). Jay Laub, The Development of the Israeli-Egyptian-American Relationship from the Death of Egyptian President Gamal Abdel Nasser in September 1970 to the Camp David Agreements in September 1978 (London, 1998). Linda Miller, Shadow and Substance: Jimmy Carter and the Camp David Accords (1992). William Quandt, ed., The Middle East: Ten Years after Camp David (Washington, DC, 1988). William Quandt, Camp David: Peacemaking and Politics (1986). Robert Freedman, ed., The Middle East since Camp David (Boulder, CO, 1984). Melvin Friedlander, Sadat and Begin: The Domestic Politics of Peacemaking (Boulder, CO, 1983).